Despite the #SeptemberSummer we are experiencing these days even in far Northern Vermont, our farm stands and Farmers’ Markets are exploding with winter squash and root vegetables. Time to think about oven cooking, right? Well, that’s what we thought too. Here’s a fast, vegetarian, (and easy to convert to vegan), gluten free, and low calorie meal you can whip up during cocktail hour, and eat before 7:00! 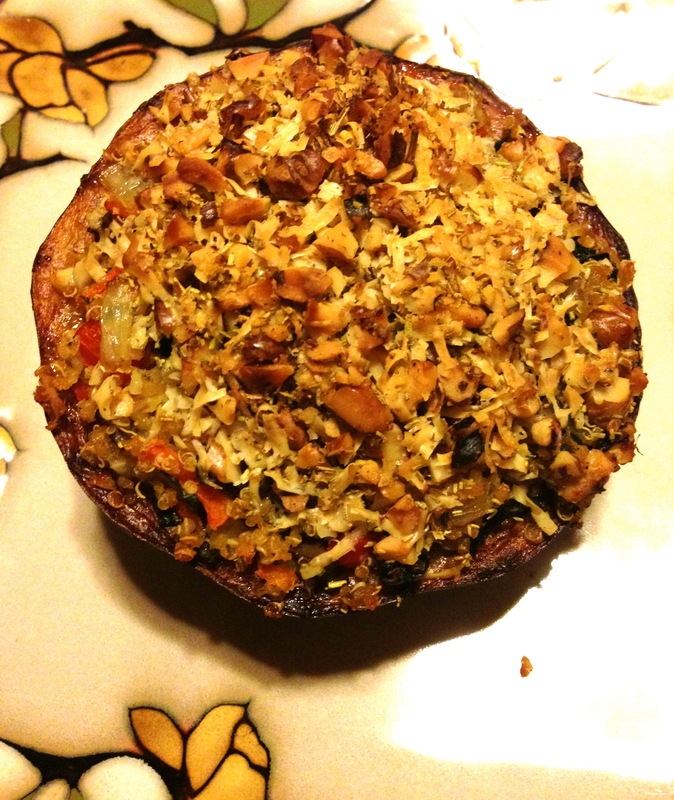 Ready to stuff an acorn squash? 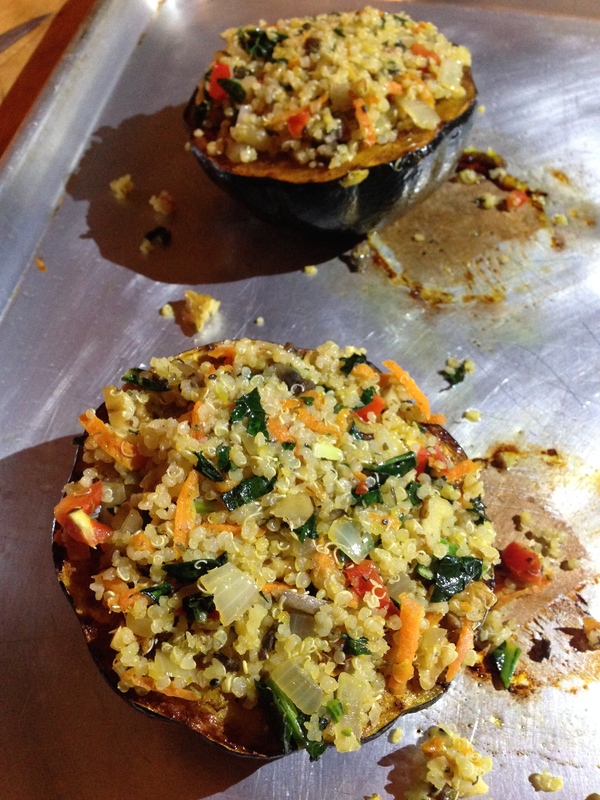 Well, here we go… Quinoa is an amazing food. 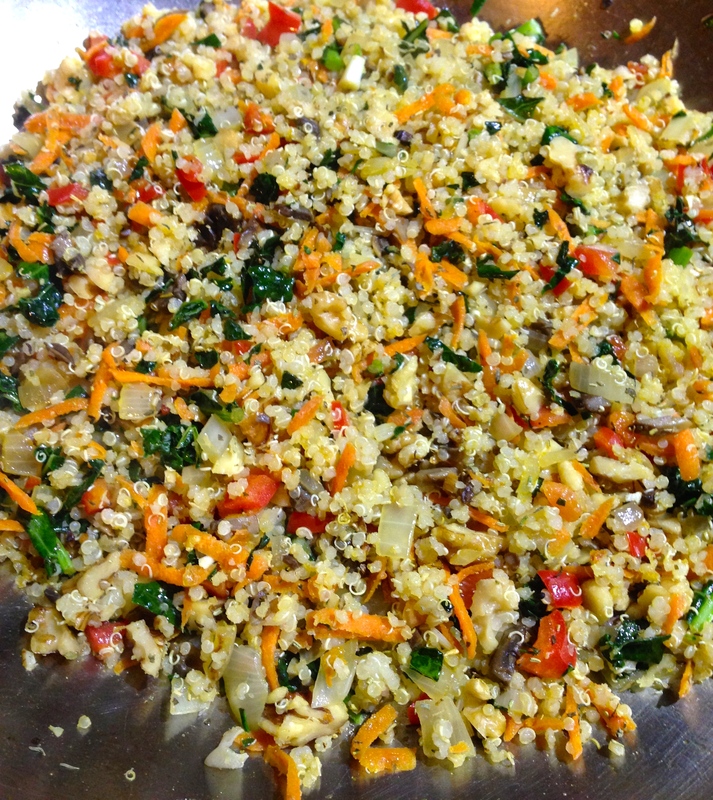 It looks and cooks like a grain, but miraculously is also a protein and is high in fiber. I liken it to heaven. This recipe calls for cooked quinoa, so if you have some left over in the fridge, grab it; if not, it is 2 cups of water to 1 cup of quinoa, and this cooks up within 10–20 minutes, so before you pop your cork, get this boiling on the stove. Cut your acorn squash in half, scoop out the seeds, brush the inside with olive oil, place face down on a cookie sheet, and cook in your over at 350 degrees. Now pop and pour. How about a old-school Chardonnay? We are loving Bread & Butter from Napa Valley. But whatever your fancy, pour now. You can use any vegetable for the stuffing. Seriously, vegetables just blend, no matter what, they all blend and taste great. Poke around in your fridge and see what you have. We found carrots, red & orange peppers, kale, onions, and mushrooms in ours, so that’s what we used. Dice what you have in small pieces and saute until cooked; salt & pepper to taste. Ready for a second glass? Oh, yes you are! So mix up the topping while the veggies are cooking. 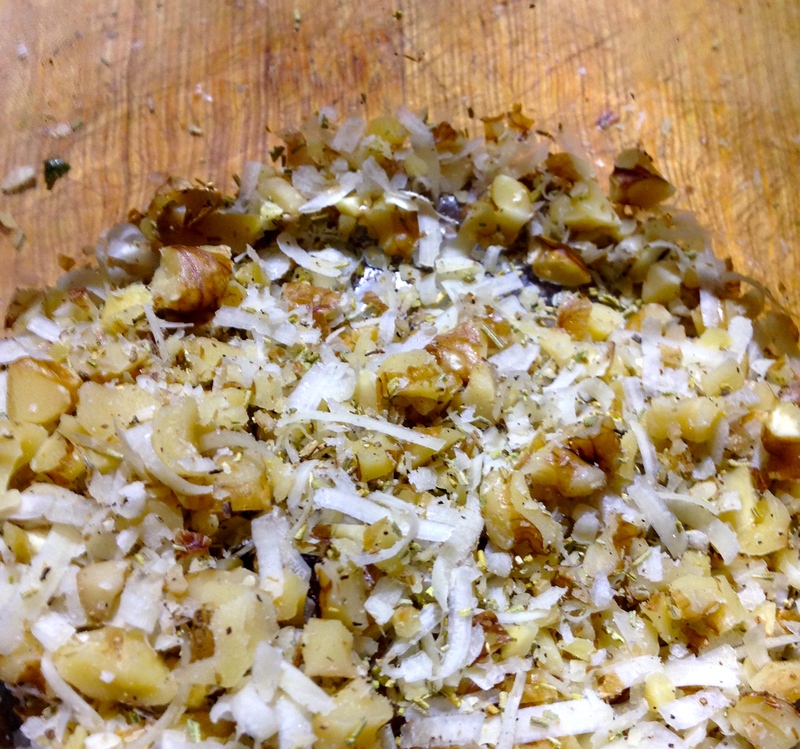 Chop walnuts and shred Parmigiana-Reggiano cheese, (Nutritional Yeast if you are Vegan), sprinkle in gluten free Panko & Bell seasoning: mix all together. By now your veggies are done and so is your squash (test by pushing a knife through the thickest part–it should slid through easily). Remove from the oven and flip both halves over and fill with the veggie mixture. Add the topping, and use your hand to push down into the soft veggies and squash, to firmly compress the topping; put back into the oven and cook until the top browns. Time to take your harvest masterpiece out of the oven, and enjoy! Yes, Autumn is coming, and those dreaded dark months after that, but for now, enjoy all the lingering and delicious sunshine and the lively taste of the garden on your plate! Sit and enjoy, chat about the day, and welcome the relaxing evening. Do let me know how you and your dinner fares please! Of course, all cooking creds go to my dear Savvy Skillet who makes my eating a healthy and simple feast every day. Looks great! I want to try this one! !